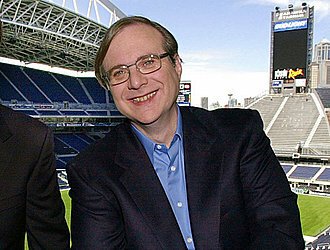 SEATTLE (AP) — Paul G. Allen, who co-founded Microsoft with his childhood friend Bill Gates before becoming a billionaire philanthropist who invested in conservation, space travel, arts and culture and professional sports, died Monday. He was 65. Allen, an avid sports fan, owned the Portland Trail Blazers and the Seattle Seahawks. Gates and company didn't invent the operating system. To meet IBM's needs, they spent $50,000 to buy one known as QDOS from another programmer, Tim Paterson. Eventually the product refined by Microsoft — and renamed DOS, for Disk Operating System — became the core of IBM PCs and their clones, catapulting Microsoft into its dominant position in the PC industry. When he released his 2011 memoir, "Idea Man," he allowed 60 Minutes inside his home on Lake Washington, across the water from Seattle, revealing collections that ranged from the guitar Jimi Hendrix played at Woodstock to vintage war planes and a 300-foot yacht with its own submarine. Allen served as Microsoft's executive vice president of research and new product development until 1983, when he resigned after being diagnosed with cancer.